Patrick Williams is a poet and academic librarian living in Central New York. His recent work appears in publications including Prelude, Third Point Press, 3:AM Magazine, The Mackinac, and Heavy Feather Review. He is the editor of Really System, a journal of poetry and extensible poetics. You can find him on Twitter @activitystory. He blogs at activitystory.com. 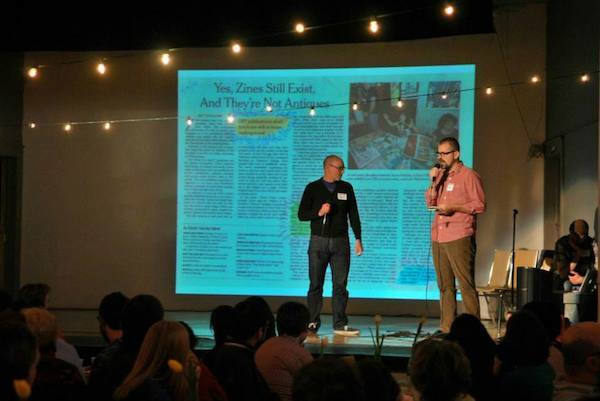 Jason Luther is a doctoral student in composition and rhetoric at Syracuse University studying zines and DIY culture. He is the former director of the SU Writing Center and a long time maker and collector of zines. You can find him on Twitter @jwluther. He also blogs at taxomania.org. Williams (left) and Luther (right) pitch SIP at the 2013 Salt City DISHES event. Photo by Allison Gates.